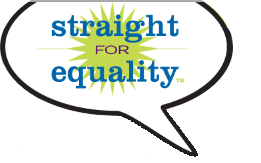 Straight for Equality is a national outreach and education program created in 2007 by PFLAG National to empower new allies who, unlike a more traditional PFLAG member, don’t necessarily have a family connection to the lesbian, gay, bisexual, transgender, and queer (LGBTQ) community. If you’re one of the roughly 8 in 10 people who can say, “I have an LGBTQ friend (or coworker, or acquaintance)” this is the place for you. Straight for Equality provides information and resources that will help straight allies understand their role in supporting and advocating for LGBTQ people. PFLAG’s work with parents and families over the past 45 years has helped us learn that there is a coming out process for allies. It takes learning and resources if allies want to move from just feeling supportive to actively being supportive. For us, ally is both an identity and a verb. We’re not talking about major political protests (although that's certainly an option) but the everyday changes and conversations that raise awareness and challenge assumptions and stereotypes about LGBTQ people. We don’t demand allies to be totally "there" on all issues, and you don’t have to know everything about statistics, national legislation, or state-wide ballot initiatives to stand up for equality and fairness. We just ask that you be willing to learn more and speak up when you have the chance. We’re here to be sure that all allies have the opportunity to share their strong and powerful voice in support of equality. Welcome to PFLAG's Straight for Equality program!